I’d like to share my personal experience with animal communication, how it changed my life and my relationship with my greatest teacher – Gin. One of the tools I value the most in my work is what’s commonly referred to as animal communication. In this three part series I’ll share my personal experiences of animal communication: how I came to be a believer, how I have worked with it in my rehabilitation practice, and how I have seen it create both positive and negative outcomes. Ultimately I hope to shed some light on this powerful way to connect and communicate with our horses, and other animals, responsibly. My first experience with this kind of work happened twenty plus years ago while I was the manager of a 30-stall barn in the mountains of Colorado. It has been one of the most valued tools in my toolbox ever since. And believe me, I was a hard sell, coming from a strong scientific background. My introduction to animal communication only happened because of Gin and her story started long before my first experience with this level of animal consciousness. Gin was raised on a ranch that specialized in breeding reining and cutting quarter horses. The mares were turned out on large acreages and foaled in herds. It sounds like such an idyllic way to grow up doesn’t it? Until the foals were ready to be weaned – at which point the family band was rounded up into large sorting pens where the foals were separated from their Mother’s, roped, branded (in 3 different places), and weaned. During this procedure Gin’s withers were broken. That was her first real contact with humans. I met Gin when she was one and half years old as my assigned horse for colt starting class my senior year of college. To say she was the toughest horse I had ever been around would be an understatement. She was smart, sensitive and refused to submit to the kinds of methods we were being taught. Every time we joined the class in training sessions it was two or more hours of drama. The only headway I ever made was in the many hours I spent with her one on one outside of class. Gin was shipped out with the rest of the 2 year olds that had been loaned to our class at the end of my senior year. I was heartbroken. For all the challenges she presented she was a part of me by that time. I graduated, moved to Carbondale, got married and settled into life outside of college. Not six months later a gentleman who had been in colt starting class with me called to tell me that he had gone to the auction, 3 states away, to purchase the filly he had trained during class. He had ended up with Gin instead. He just wanted me to know she was back in Colorado. I couldn’t believe it! Of course I thanked him and told him if he ever needed to find her a home, call me first. One month later he did. Steve and I had just gotten married. We pooled together all the money we’d been given as wedding gifts and I sold the pony my Dad had given me as a graduation present – we had just enough to buy Gin. Four years later I am the manager of the barn and Gin is still with me, now a smart, tenacious, incredibly athletic 6 year-old, chestnut, quarter horse mare. Obviously she had plenty of reasons to distrust humans and nothing I tried seemed to help her trust me. I didn’t understand all this back then but looking back I can see why she struggled. I was constantly in search of someone who could help me find an inroad with this amazing horse. As luck would have it I ran across two clinics that sounded intriguing. I decided to go audit both. That’s how I met Mark Rashid and Kim Walnes. Both were so different in their approach from anything I’d ever seen and I liked what I saw. I ended up hosting two clinics a year with each of them for several years after that first meeting. It was such a relief to have help with Gin that seemed to be making in roads. Finally! And yet, she was still distant, not a horse that relished human contact or connection. For a horse crazy young woman wanting nothing more than to have my horse love me as much as I loved her, our situation broke my heart. It was Kim who first suggested I try an animal communicator. ‘A what?’ I said. 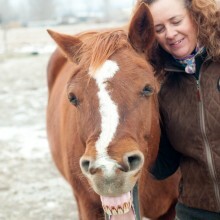 I could not imagine how someone who lived in Pennsylvania was going to ‘talk’ to my horse in Colorado – I mean really? I don’t know. Maybe there was a part of me that always knew this level of communication was possible. All I know is that after a particularly frustrating few months I threw up my hands and decided I had nothing left to lose. So with hat in hand I called Theresa Whitedove for the first time. Theresa told me in a very matter-of-fact way that she would spend a week talking with Gin. We set a time to re-connect and I set about waiting to see what would happen. Still the skeptic, I decided to be as scientific as possible about this animal communication experiment. So I did nothing with Gin that week. Any changes that happened I wanted to know they had something to with what happened with Theresa. Almost immediately I noticed things were different. All during that week I’d see Gin engaging in behaviors out in the pasture that were not normal for her. For example, I’d often see her hanging out by herself during feeding time – all the other mares chowing down on hay and Gin standing off on her own, ears turned slightly back and out to the sides, a characteristic pose for her when she was listening inward. Then it got even weirder when boarders started coming up to me at random and asking me what I had done with Gin. ‘What do you mean?’ I would ask. Each of them would tell a similar story about how Gin had never shown the slightest interest in them and all of a sudden this week she started showing up when they would come to get their horse – taking cookies from them or putting her head over their shoulder and allowing them to pet her. Huh….. I waited with baited breath for the phone meeting with Theresa. To my great surprise I was blown away by the things she told me about my horse. Everything was so accurate and the positive changes in Gin undeniable. I remember laughing when she told me that it took 3 days for Gin to acknowledge her presence. She had very little use for humans and the only reason she decided to give Theresa a chance was because it was such a novel experience for her to have a human talk to her who wasn’t physically there. So like Gin to be as skeptical as me. When she asked her about her relationship with humans she confirmed that she really didn’t like humans and certainly didn’t trust them. When Theresa asked: ‘what about Andrea?’ She grudgingly admitted that she felt I was better than most, but still a human, so while she tolerated me it wasn’t as though she was thrilled. I have certainly witnessed enough over the years to firmly believe that horses are sentient, intelligent, and conscious and all the other words that imply that they are more like us in how they experience emotions and learn than they are different. I don’t need any scientific studies to prove this to me because I feel it and experience it every single day. In fact, Gin, now 25 years old, gives me daily tutorials on how to communicate and indeed, how to be a better person. This capacity to communicate on this level with horses and other animals fulfills a childhood dream. For all of us who have the experience of connecting with horses on this level it is a wondrous thing. It seems like such a sweet thing and yet with that level of communication comes enormous responsibility. It is all too easy to ascribe human motivations and human idiosyncrasies to our horses when we realize that we can carry on conversations with them. And this, in my opinion, is potentially dangerous territory. Join me next week for part 2 where I’ll share my experiences with some of the many horses that have crossed my path over the years and how animal communication has been instrumental in helping us find a path to healing.